My, you're organised this year, aren't you? Registration has been open for less than two weeks, and we already have 62 prereigstrations. That's double what we had this time last year (when we started earlier). Last year, we didn't get to this stage until January. Despite organising a pile of games for first and second rounds, I hadn't expected quite this level of demand, and game choices are narrowing fast. Which means we need more games, at least a couple each session. So, if you have an idea for a game, and want to give con GMing a go, then please do. Not only will you gain the acclaim of your players and the thanks of a grateful gaming community, you'll also get discounted entry and the chance to signup for sessions later in the con. 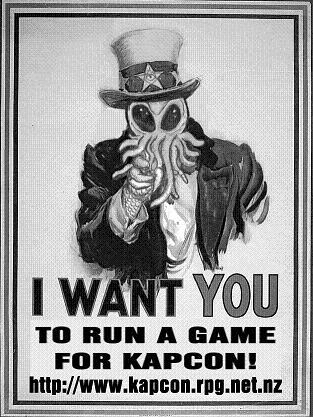 So, click that Run a Game link, and help make KapCon happen.